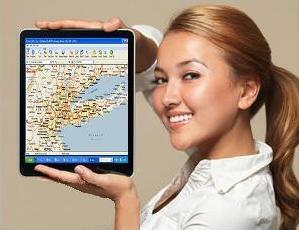 Leading GPS for Truckers Just Got Better! LOUISVILLE, Ky., March 30, 2011 /PRNewswire/ — Rand McNally’s IntelliRoute® TND™ line of GPS products for the over-the-road driver now provides two types of traffic – historic and real-time. The IntelliRoute® TND™ 510 and 710 devices provide real-time traffic via a plug-in accessory. The accessory includes lifetime traffic, which is provided by NAVTEQ, the leading global provider of maps, traffic and location data. Real-time traffic enables drivers to assess increased travel time due to a traffic accident or volume bottleneck during rush hours and determine whether to re-route, or stay on the current route. In either case, the driver is able to provide an up-to-date time of arrival to his dispatcher or customer. NAVTEQ Traffic-RDS collects, processes, and distributes real-time traffic conditions from a spectrum of traffic information sources across 98 Markets in North America. “We are pleased to be able to work with Rand McNally to provide product features that will enhance the usage experience of the IntelliRoute® TND™ GPS units. We know that the most frustrating situation for any driver is unanticipated delays. Real-time traffic puts the decision in the driver’s hands,” explained Roy Kolstad, VP Enterprise Americas NAVTEQ. Historic traffic information, provided by Rand McNally’s partner, TrafficCast, is automatically incorporated into the routing on the IntelliRoute® TND™ 710 truck GPS device via the Traffic Predictor feature. In this case, the router will take into consideration historic traffic on any route provided, seeking alternative, faster routes if available for the driver. TrafficCast’s Dynaflow™ product is based on millions of data points that track vehicle movements through real-time GPS (Global Positioning System) systems. The data collected is integrated with incident reports, public sensors, weather, construction and local events to model expected road speeds on virtually all expressways and major highways in the United States. “Being able to demonstrate the value of historic traffic patterns via incorporation into routes for commercial drivers is a very exciting twist for our company. Alternate routes and their travel times are increasingly important variables; drivers don’t want just directions, they want the best route,” noted Al McGowan, CEO of TrafficCast.